Former Minister of KSF, Dr. Shin, Won Sop, was on Friday elected Chairperson of the FAO(Food and Agriculture Organization)’s 25th Session of the Committee on Forestry (COFO) for the period 2018-2020. COFO is one of the FAO’s governing bodies, with over 130 member countries, which deliberate on global forestry issues. 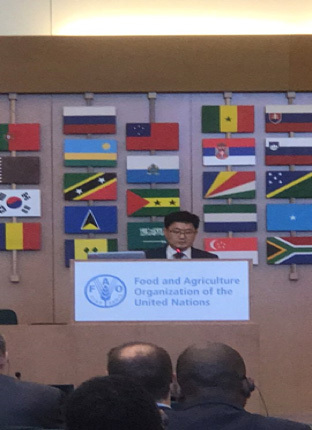 Dr. Shin delivered acceptance speech upon his election as Chairperson at the 24th Session of the Committee on Forestry (COFO) meeting convened in Rome, Italy from June 16-21, 2018.